This is just a quick note to thank you for sending me unsolicited snail mail. I'm glad it was only snail mail and not email, because otherwise you would have been violating the ECT Act as well as the other laws and ethics you just broke. You see, it's not only unethical to buy names and addresses of random people and then run a credit check on them without their knowledge, it's bad business. However, Nedbank is also a member of the Direct Marketing Association, and as such has publicly agreed to abide by their code of conduct. Sending me such a letter, signed by Graeme Holmes, the Head of Consumer Cards, is thus a breach of their code of conduct, and tells me that you were really sloppy and didn't check my name against their "Do Not Contact List". Either that, or you just really don't care about my privacy. Now credit card companies are notoriously bad about "leaking" names to direct marketers, but in South Africa that's a criminal offence. By sending me this letter you have identified yourselves as a "dodgy bank" (aren't they all?) who is incapable of keeping my contact details private, as you are required by law. Alternatively, you are happy to ignore the privacy of any future clients by buying my name from a dodgy marketer, with no morals and no scruples. I guess that makes you guys a perfect fit. So since you have identified yourselves to me as a company who keeps company with criminals (or are criminals yourselves by violating the law), I have decided, as a public service, to identify your unethical behaviour to the public at large. I'm also going to warn them, courtesy of this article, that your credit card fees are, to put it bluntly, greedy and excessive. They are double what I am paying. Small wonder you are willing to go to the expense of sending me snail mail, and paying for my name and address. Shame on you! And before your self-satisfied smug sense of outrage kicks in, I did personally warn your organisation that I do not take kindly to unsolicited marketing campaigns. The date: 9th January 2007. I guess you didn't get or read the memo. Ag, shame! 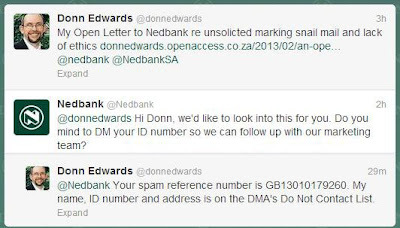 Update Monday 5pm: Nedbank's chief twit wants me to send my ID number to them via Twitter. Funny, I supplied this information many years ago, and it is also in the DMA's Do Not Contact list. They would have to have it when the bought the marketing list in order to comply with the DMA's Code of Conduct. Clearly they haven't complied with the code of conduct, which is why are now looking stupid with egg on their faces. Update Tuesday 12: In reading through the Nedbank Code of Ethics I find no mention of the word "privacy", even though Nedbank ascribes to the DMA's Code of Conduct, but it does mention the word "confidentiality" several times. 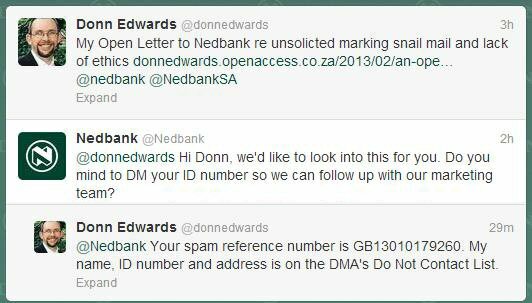 Clearly Nedbank doesn't think my contact details are confidential enough to worry about. I guess they aren't really serious about their Code of Ethics, and write it off as public relations double-speak. Update Thursday 14: I finally heard from Graeme Holmes, after I guessed his email address (first name, plus first letter of surname, followed by Nedbank domain name) since I wasn't getting anywhere with the HelloPeter complaint drones. Graeme is convinced that I must have been an account holder with Nedbank at some point, because they don't buy lists of names. I corrected this false assumption, and await the results of an internal investigation. Yeah, right.